Hapkido fundamentals: Build a strong foundation for your hapkido skills. Video instruction includes falls, breathing, kicks, and strikes of Kyung Mu Hapkido. App 3: Self Defense Applications. 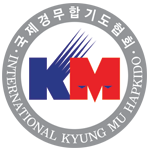 This video App focuses on self defense applications of basic Hapkido techniques as taught within Kyung Mu Hapkido. App 4: Advanced Hapkido Training. Includes techniques for sitting, cane, knife defenses, short stick, and tackles. The TV Show Fight Quest premiered on the Discovery Channel a few years ago, with parts filmed on location at the HQ school. Grandmaster Kim and a few members of the Kyung Mu Hapkido family were featured in this mini documentary on Hapkido. A short video collage of Grandmaster Kim Nam Jai during a series of seminars at the KyungMu Kwan school in Seoul South Korea.